We’ve got internet at the lake now. So, I’ve been able to enjoy working on my computer projects without ever going home. Other than one very quick run back to the house to pick up something I forgot, we’ve spent the holiday hanging out by and on the water. Saturday morning, I did my usual morning photo boat ride and then spent the day playing with the pictures on the computer. After being undercover for nearly a month of thunderstorms and a hurricane, the seats were covered with mold. Joy took a deep breath as she went out with me on the boat and cleaned for an hour. By the time the boat got back it was looking bright and new. Sunday we went up to the club house for vespers service. Joy enjoyed zipping around on her waverunner. Our new friends at the lake (and from Pittsburgh) joined us for a slow long tour of the lake on the pontoon boat, and hung out with us sipping wine as we watched a great day disappear into night. If you’ve got three minutes or so, watch the video below to see some of the things Moku has seen at the lake this weekend. So does by my brother-in-law. Thanks to his own hard work, the family had a beautiful venue in which to celebrate Paul’s birthday. He built a privacy fence around the backyard, landscaped, and added a spa. Sarah set the table outside. The setting reminded me of those old Ernest & Julio Gallo advertisements where their family is at the table out in the vineyard. Only my family is better looking of course. “Hey good lookin’. What you got cookin’?” Yesterday, our church community group got together for an afternoon dedicated to one of my greatest interests – FOOD. Chef Kyle came into the Deakles home and showed us how to prepare three entrées. In turn we showed him how to eat three entrées. It was an awesome afternoon well spent. But apparently all that food contributes to memory loss. I forgot to step on the scales this morning. Enjoying playing with my camera’s settings. The gardenia picture was composed to allow space on the left for icons on my desktop when I use it as a background. Even at 14 years of age, Rhapsody of the Seas is a good looking vessel. She was clean and well-maintained. 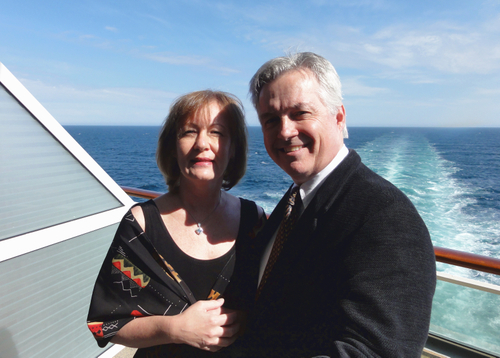 On our Alaskan cruise, we opted for the stateroom we had envied on previous cruises. This was our first time in a junior suite – and it was sweet. Our center aft balcony provided us 180 degree views of everything our ship passed. The balcony itself was quite large, possibly 10′ x 14′. Underway, our deck was in the lee of the ship providing us with as much shelter has could be expected in outdoor Alaska. But most of the views could have been enjoyed from our nice little indoor sitting area. This was the first time we did not go to the Atrium pool to read. We did see many others enjoying that space as we passed through on our way from the Windjammer cafeteria to our stateroom. But that stateroom was just too attractive to leave alone. At the 6pm “main” seating, we had great company. A cute young Mexican couple, both software engineers working in Houston; an Orange County Ph.D. candidate, his Columbian wife, who worked in medical software development, and their toddler; a Scot who had taken up citizenship in his long-time home of Australia and his Filipino wife; and a recently retired couple from Hong Kong whose children had taken over their import business. One of our favorite parts of every cruise are the wonderful people with whom we have a chance to talk. We also had the chance talk with two people from outside Oxford, and three generations of Cubans now living in Miami, during different meals in the Windjammer. There wasn’t much rain falling when the ship reached port. Given that Ketchikan averages about 14.5 ft (4.4 m) of rain per year, that was something for which to be thankful. While the portion of Ketchikan at the higher elevation in town looked much like a working class Pittsburgh neighborhood, the lower portion that services the cruise ships consisted of attractive little tourist shops. As we wandered into this section, Joy noticed an inclined tram suggestive of The Incline in Pittsburgh, and we started to make our way over there. That is how we discovered the little market area in the video. The Creek Street markets sit on stilts along the creek (where else?). Until 1953 it had served as the red light district in Ketchikan, but today shoppers find Alaskan art, fish, and souvenirs. One shop had a model train with the engines from the White Pass & Yukon on which we had just enjoyed a tour. What a great toy train that would be to have under one’s Christmas tree! As we worked our way back to the ship, we stopped in a shop, Barnaby’s Old Town, where an Alaskan Malamute lie on the floor accepting shoppers’ tokens of affection. The shopkeeper told us the story behind the totem with the whale on the bottom. 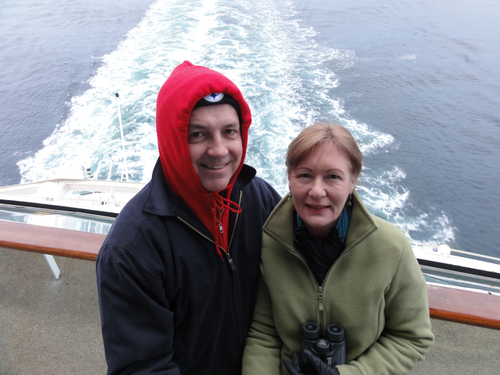 Joy continued our tradition of buying Christmas ornaments on each cruise by picking a totem pole ornament there. By the time we got back to the ship, the rain was really coming down. But frankly the only impact that had on us was that Joy would hold her umbrella over my camera when I tried to take a picture. 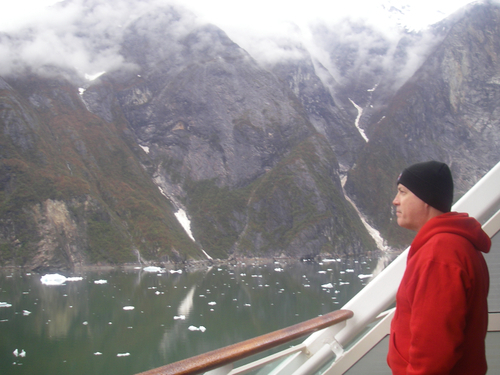 A ship from Princess Cruises had recently attempted passage to Sawyer Glacier on Tracy Arm Fjord, but had informed the captains of other ships that there had been too much ice in the fjord to make it. The master of Rhapsody of the Seas announced that we might expect a similar fate, but that we would give it a try. He placed crew members out on the port and starboard wings to provide precise feedback with regards to his proximity to icebergs or shallow water. He placed a third person on the stern to let him know that he could swing the boat without butting into anything. Ever so slowly we progressed down the fjord. Joy started taking pictures when it was practically dark. What if now was the best view of icebergs we would get? But as daylight dawned, the fjord became increasingly thick with ice. Watching the Titanic on this cruise would be akin to watching Jaws at a beach house in the Vineyard – ill advised. But instead of fear, the ship’s passengers seemed silenced by awe as we navigated past floating glacier blue ice, beneath rocky vertical mountain faces interrupted frequently by slender but soaring waterfalls. What human cathedrals aspire to inspire, Creation effortlessly brought upon us – awe and worship. We made it all the way to Sawyer Island where we enjoyed a clear view of Sawyer glacier. The blue ice hidden in its bowels caught the morning sun in a way that made it seem to glow from within. But the star of the show was an iceberg I would estimate to have been 15 to 20 meters long. It was resting on the downstream side of Sawyer Island. Its blue ice dazzled. The cruise director said that piece of ice could have just completed a 10,000 year journey as part of the glacier – 10,000 years. 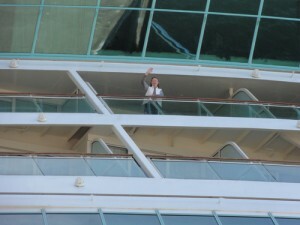 How wonderful that our cruise occurred at this fortuitous moment. What a privilege to see this. This cruise is certainly unique. 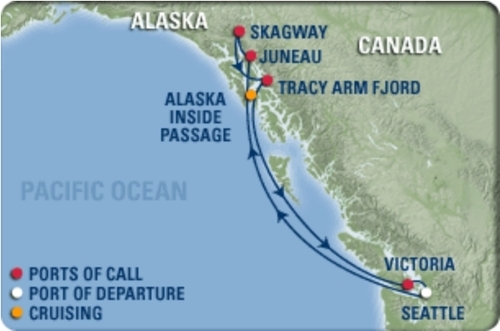 Joy favored Ketchikan, but I found Skagway to be the most charming of our ports. With less than 900 year round residents, this little hamlet hosts approximately 900,000 visitors each summer. Why do they come? Maybe it is the quaint, clean, streets and shops of the village. Perhaps the attraction is the beauty of the surrounding wilderness. Some may be drawn to the romance of gold rush history. Others may just want to ride the scenic railroad that climbs nearly 3,000 feet to White Pass on the Canadian border. Whatever draws you up here, I don’t think you will regret it. Especially, if you get the kind of sunny beautiful day we had. Skagway’s weather is slightly drier and cooler than Morgantown or Pittsburgh, but the winter low temperatures are about the same. Pretty impressive for the Alaska panhandle. Later in the afternoon, I walked up the flat portion of the Dewey Lakes trail along Pullen Creek. The water was clear, but I didn’t see a single sign of aquatic life. Some beautiful western blue Steller’s Jays were flitting around creekside and kept me entertained for awhile. This quiet time taking pictures by the creek is a golden memory for me. It was like being transported back to the explorations of my youth. Although, a Canadian told me that the scenery coming out of Vancouver would have been beautiful, it was dark when we left Vancouver. 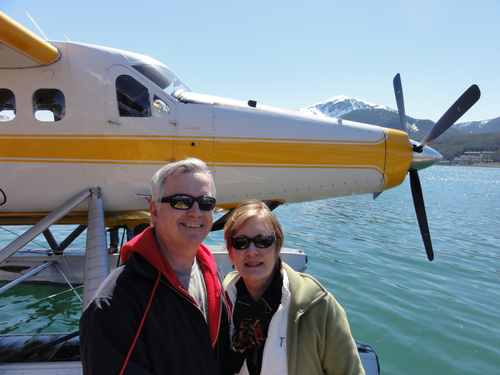 The next day, however, as we entered the “Inside Passage” to southeastern Alaska, the waterway was all that we had hoped it would be. Little islands, wooded shorelines, mountain vistas, were all there. We could even watch killer whales spouting from our table in the Windjammer cafeteria as we ate breakfast. Later we enjoyed an even closer view from our balcony.